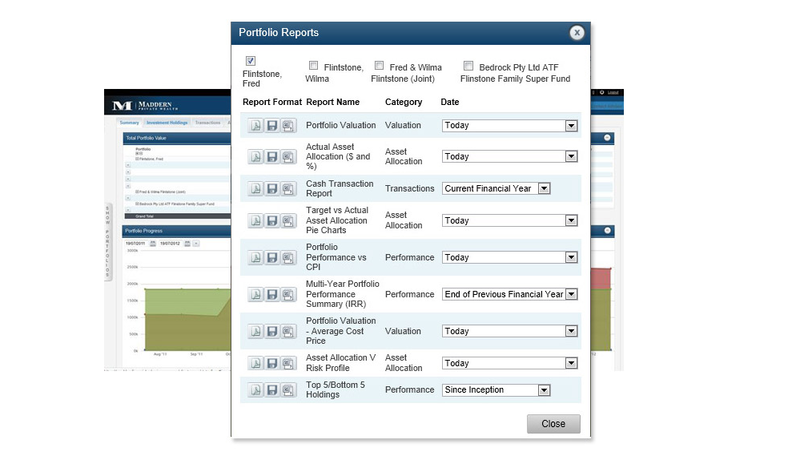 Direct Portfolio is a comprehensive Investment Platform like no other. We have spent years building and cultivating a completely unbiased, independent and dynamic facility, whereby you can hold and view all of your assets in one place, with just one click. As a client of Maddern Financial Advisers, this service is available to all of our clients. Password problems? Please call our office on 03 9999 7200 and we will assist you. Contact your portfolio manager or speak with any member of Maddern Financial Advisers. As a client of Maddern Financial Advisers, we are more than happy to provide a login for you. Please see the screenshots which explain what you receive with your login and the benefits of having this valuable access to your portfolio. Please call 03 9999 7200 and we will be happy to assist.